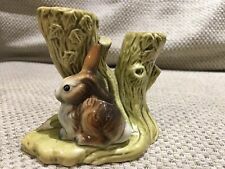 Vintage Withernsea Eastgate Pottery -"Fauna" Vase, Tree with Squirrel c1960'sSize 15.5(H) x 13.5(W) x 8.3(D), weight app' 0.5kg.See photos for condition, no chips or cracks, age crazed. 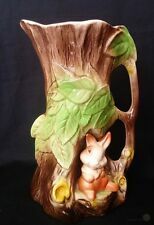 A beautiful retro Eastgate Pottery jug, vase depicting a tree trunk with applied fawn, size is 225 mm, 8.75" tall. Made by the Eastgate Pottery. Decorated in mainly green with a mottle brown body. 10cm wide at base. 23.5cm high. See pictures. See further BIG pictures of this item below. Boxes will be marked 'FRAGILE'. About Photos. I try my best to take photos as representative, as I can, of the item being sold. Social Sharing. Approx Item Weight: kg. Mould No 974. In good condition. Small knock to lower foot rim (see photo). 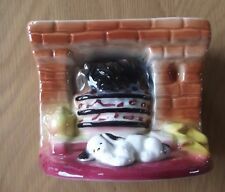 THIS ITEM IS IN GOOD ORDER AND HARD TO FIND MODEL BY EASTGATE POTTERY. Withernsea Eastgate Bloom Trough with Rabbit in very good condition. Eastgate mark to base of item. It is cute, fun, cheeky and retro. In very good condition. Measures approx 6” in length. Very similar to the output of other, related potteries such as Hornsea. Maker's stamp is on the base just inside the front edge of the piece. Weight : 192g. Curved dish blue underneath white leaves on black ground. Slight signs of use. Approx length 7". A gorgeous 1960's posy vase from Eastgate Potteries, a tiny fawn in Fauna, has a couple of minute losses to the overglaze decoration but overall presents very well, size is approx 150 mm, 6" long x 75 mm, 3" tall. WE DO SHIP OVERSEAS. Has the Eastgate & Withernsea Lighthouse stamp with a mould number (800) for the piece. This is a really lovely retro coffee set from the 1960's, in a lovely golden honey glaze. Ideal for any collector, but still a great to use and enjoy. Manufactured at the Eastgate Pottery in Withernsea, East Yorkshire in the 60s/70s. The plate has a sumptuous rounded edge to its unusual triangular shape (the photos describe it better). They have a creamy satin glaze with a pretty floral transfer pattern. Eastgate 972 Poise Vase Faun under a Small Tree in Good Condition Considering the age of this item. From Smoke Free Household. Clear Eastgate backstamp used prior to 1967. 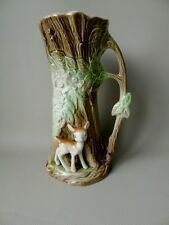 This lot is a 10" vase in Fauna-Squirrel/Fawn design. A POT POURRI OF ANTIQUES, PERIOD PORCELAIN, GLASS & SILVER ALONG WITH UNUSUAL COLLECTABLES & ORIGINAL ART. Pretty little posy vase by Eastgate. This is a fabulous piece of studio pottery from the 1970s. It was made by the Eastgate Pottery in a Withernsea East Yorkshire. It was a Limited Edition of only 300 Wall Plaques. The plaque was designed by Mr H Ibbetson a Hull artist and was sold by Hammonds in Paragon Square Hull. Vintage 1960s Retro Eastgate Pottery Coffee Pot Withernsea- Mustard Yellow / gold colour 11 “. Tall Beautiful coffee pot from Eastgate Pottery. In great vintage condition except for a chip on inside of lid . See picture It dates from the 1960's, and is in a geometric design (diamonds) in their golden honey glaze approx 11 inches tall. Has the Eastgate & Withernsea Lighthouse stamp with a mould number (773)for the piece. Please view all photos as they do make up part of my description. Dispatched with Royal Mail 2nd Class. Eastgate Pottery Curved Dish. Approx at highest 1 3/4". Approx width 4 1/4". Approx length 7". It is crazed. Vintage Pottery Eastgate Withernsea Jug With Fawn / Deer Mould Number 58. Vintage Withernsea Eastgate pottery 60s Vase 102 . Condition is Used but very good condition . Dispatched with Royal Mail 2nd Class. Relief image Windsor Castle. Footed Tri-Corner Dish / Bowl. Am selling a beautiful Deer ornament. Stunning. Deer resting next to a tree. Height approx 10.5cm. Base approx 9cm x 6cm. Please see base photo. I have reflected this in the price. Thankyou, FAUNA. WITHERNSEA EASTGATE.. ENGLAND. 1960s era. ...VINTAGE... This beautiful Deer ornament is in GOOD CONDITION. WITHERNSEA EASTGATE LIGHTHOUSE MARK ENGLAND POTTERY. EASTGATE FANUA. EASTGATE ENGLAND. LOG/TREE TRUNK TWIN POSY VASE. FROM THEIR FAUNA COLLECTION. HAVING A SEATED RABBIT AT BOTTOM OF TREE. EARLY 1967 PRINTED UNDERGLAZED BLACK MARK. On base is the Withernsea Eastgate England Pottery mark and Fauna. E92 is impressed. 9.5 cm at highesto. 21 cm in length at widest. Withernsea Eastgate Pottery Milk Jug in Pineapple Pattern. Vintage Eastgate Pottery, Withernsea Milk Jug in Pineapple Pattern, colour Honey. In Excellent Used Condition no Chips 🍟Cracks Nibbles or Crazing. Height 4.25" , diameter 2.5" . Photos taken under artificial light so colour may appear different from the original item. Reasonable offers considered.I am happy ☺to combine postage if you find something else you wish to purchase. B14. no375. Eastgate Pottery Withernsea Fauna. Tree Shaped Vase with Squirrel.